Cop-On-Top this Weekend in Kearney! The roof is not typically the first place you look when walking into a Walmart, but patrons visiting the Kearney Walmart this weekend might see something interesting going on up there this time around. Our own Officer Vanhorn of the Kearney Police Department will be calling the Walmart roof his home for the weekend of December 19-21st. Cop-on-Top consists of one very brave law enforcement officer spending a weekend (day AND night) living on top of Walmart, come snow or wild geese! 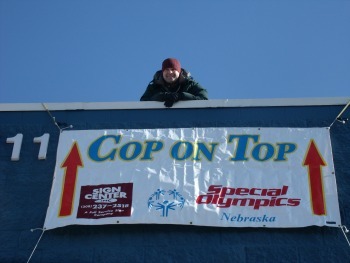 And Officer Vanhorn isn't coming down until he's collected enough donations for Special Olympics Nebraska! The goal he set this year is to raise $5,000 for the athletes of Special Olympics Nebraska. This is Officer Vanhorn's 3rd year doing the Cop-on-Top. We chatted with him recently to learn what would motivate someone to live on top of a Walmart in the dead of winter. 1) Why do you continue to expose yourself to the elements on top of the Walmart year after year? I expose myself to the elements so we can raise money for the athletes of SONE, and it make a guy feel good when you can walk into a store in May and get a hug from an athlete and not a stare-down from some guy/gal you dealt with many times. So I'd say its more the athletes and the impression you make on them, that they hold on to for a long time. 2) What are your goals for this Cop on Top? My goal this year is $5,000, and only then I will come down from the roof. If we reach $5,000 by Saturday at noon or early afternoon, I think I will finish out Saturday until the evening. 3) What are the benefits of this event for you as a police officer and Law Enforcement Torch Run representative? Like I said in Question 1, it is the smiles you see on the athletes' faces when you see them in public or show up at their events and they run to give you a hug or a high five or joke. They joke that you are there to take their friends to jail or themselves. So many have not had it easy and when a cop can make a day and or a smile and not a " go jump off a bridge" look by a simple hello or joke, then we have done our job on our end of the deal. Officer Vanhorn will begin his post on top of the Kearney Walmart on Friday, December 19 at 3:00pm and will remain up there until Sunday, December 21st, or reaching his $5,000 fundraising goal. Donations can be made to Special Olympics Nebraska.